WASHINGTON (AP) - President Donald Trump denounced "bigotry, intolerance and hatred in all of its very ugly forms" during his first visit to the new Smithsonian National Museum of African American History on Tuesday. Trump, in remarks after his tour, called the museum "truly great" and said he would be back to see more of the 3,000 objects illustrating African-American history. 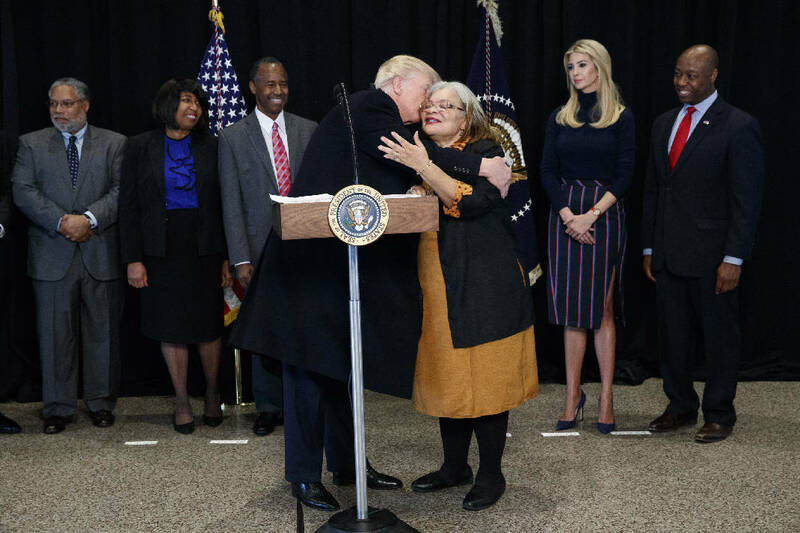 "I'm deeply proud that we now have a museum that honors the millions of African-American men and women who built our national heritage, especially when it comes to faith, culture and the unbreakable American spirit," said the president, flanked by museum officials and African-American politicians. This was Trump's first visit to the new museum, which opened September 24 to great fanfare, including a dedication by then-President Barack Obama and attendance by former Presidents Bill Clinton and George W. Bush. The Smithsonian National Museum of African American History and Culture has become one of the most popular attractions in Washington, with museum officials saying Monday that the building has already had its millionth visitor. First Lady Melania Trump visited the museum last week with Sara Netanyahu, wife of Israeli Prime Minister Benjamin Netanyahu. "It has truly become a place of healing, reconciliation and celebration where people can embrace not only African-American history and culture, but how that layered history has shaped America's identity," Lonnie Bunch, the museum's director, said Monday. Trump toured the museum Tuesday with a group that included South Carolina Sen. Rick Scott and Ben Carson, his rival-turned-secretary of Housing and Urban Development. The museum includes an exhibit dedicated to Carson's rise from poverty to prominent pediatric neurosurgeon, which the group stopped to admire and pose for photos in front of. Trump also used his visit to denounce recent threats against Jewish community centers, calling them horrible. He said the threats "are a painful and a very sad reminder of the work that still must be done to root out hate and prejudice and evil." Trump, who received only 8 percent of votes from African-Americans during his campaign, vowed to help heal the United States while in the White House. "We're going to bring this country together. Maybe bring some of the world together, but we're going to bring this country together," he said. "We have a divided country. It's been divided for many, many years, but we're going to bring it together."